මේ post එකේ කියන්නේ හිටි හැටියෙම size එක අඩු උන pen-drive එකක නැති උන space එක recover කරගන්නේ කොහොමද කියලා. සාමාන්‍ය විදියට pen-drive එක format කරාට මේක හරියන්නේ නෑ. ගොඩක් වෙලාවට වෙන්නේ bootable pen එකක් හැදුවට පස්සේ. මේක ගොඩක් දෙනෙක්ට සිද්ද උන දෙයක්, මටත් උනාට පස්සේ තමයි මේකට විසදුමක් හොයාගන්න මහන්සි උනේ. දැන් බලමු වැඩේ කරන්නේ කොහොමද කියලා. 2. දැන් pen-drive එකේ properties බැලුවම 2MB , 3MB විදියට size එක අඩු වෙලා තියෙන්නේ. 3. My computer ගිහින් Right Click කරලා manage යන්න. 4. දැන් Computer Management window එකෙන් Disk Management Select කරගන්න. 5. 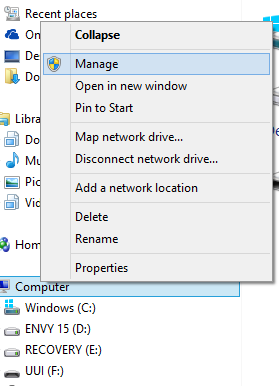 මේ windows එකේ යටම ඇති capacity අඩු උන pen-drive එක Drive එකක් විදියට. ඒකෙ දැනට තියන පොඩි partition select කරලා ඒක delete කරන්න. 6. දැන් pen-drive එකේ Full capacity එක Unallocated Space එකක් විදියට පෙන්නන්නේ. 7. 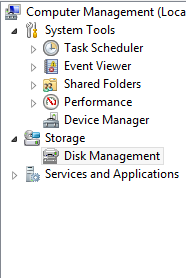 දැන් Unallocated Space එකේ right click කරලා New Simple Volume දෙන්න. ඊටපස්සේ එන window එකේ next දීලා finish කරන්න. දැන් Pen-drive එකේ නැති උන Capacity එක recover වෙලා ඇති. This entry was posted in Knowledge, Tricks and tagged disk space, flash drive, loss, pen drive, reduced, windows by dhanush_c. Bookmark the permalink.